This past Spring Break, 34 Salem State students chose to give back to the community in lieu of the traditional Spring Break experience. 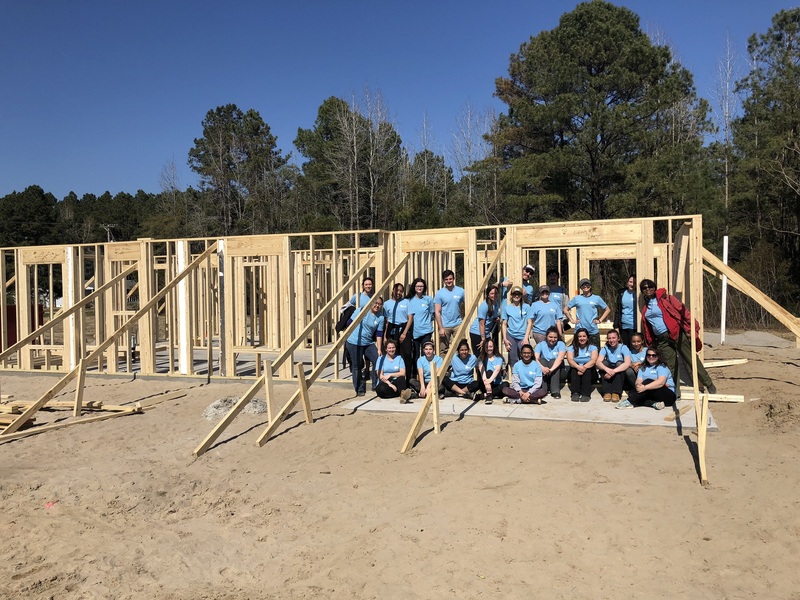 Taking part in one of Salem State’s “alternative spring break” trips, students traveled to either Texas or South Carolina where they joined Habitat for Humanity to begin construction on houses for a local family. Students were housed in local churches or retreat centers. Though schedules varied by location, students worked on Habitat for Humanity sites Monday through Friday. Bruce Perry, assistant dean of enrollment management and student life at Salem State joined students who chose to travel to South Carolina. This is just one of several service trips Salem State offers to students. Other student groups, like InterVarsity and Latin American Student Organization, volunteered in Baton Rouge, LA and Puerto Rico, respectively. The Community Service Initiative, the student organization that sponsors these trips, has been offering this Habitat for Humanity experience to students for the last 12 years, and have volunteered at other sites including New Orleans and Kansas City. Because of the trips’ continued success, students will be offered this volunteering opportunity again next spring.